Though Latina women make up about eight percent of the U.S. population and their numbers are growing, they made up only two percent of the scientists and engineers working in those professions in 2010, according to a report from the National Science Foundation. Luz Rivas, whose love of computers at an early age changed the course of her life, is determined to increase these numbers. She believes the interest and the confidence to get into technology and science has to start early. So after attending top schools and working in big companies, Rivas has gone back to her old working-class neighborhood of Pacoima in Los Angeles, California and set up an after-school program, DIY Girls. Its aim is to get more Hispanic young women into this career trayectory. When it comes to asking questions and getting involved in science and technology, "a lot of girls are shy and don't reach out," said Rivas. This is especially true during the critical time between middle school and high school. "Sometimes it's hard coming out of your shell, and I think that is a very 'Latina' thing," Rivas said. It is especially hard since many Hispanic girls don't meet mentors in these fields. Rivas launched DIY Girls as an after-school program for 5th grade girls at her former elementary school, Telfair Elementary School in Pacoima. Almost all the students are Latino and the majority qualify for the federal free or reduced lunch program. Its mission is to increase women and girls’ interest in technology and engineering through hands-on educational experiences. The program encourages women and girls to explore technology, develop their self-esteem and then guides them towards technical careers. Rivas says she wanted to take everything she had learned in STEM (science, technology, engineering and math) education and apply it to her community. She loves getting young girls excited about making their own products. A Hispanic Association of Colleges and Universities report found that during junior high school Latina students may be more hesitant to ask questions during class discussions, and are the least likely of any group to have STEM career aspirations. Rivas was fortunate; she discovered her love of computers when she was in 5th grade. Because she had always liked math and puzzles, she was instantly drawn to programming. Using computers, which no one had at home at that time, was exciting because they felt new and futuristic. At first, she thought they were simply a fun toy, but she soon realized the power they held. "I felt like I had a real skill. I always liked things that had a real answer," she explained. Ever since that moment, Rivas was determined to pursue a career in technology. Yet like the girls she is now teaching, she did not come from privilege, and had a lot to overcome. Growing up, Rivas said she, her sister and her single mother never had their own home, and often had to live in garages or rooms in other people's houses. Her mother worked in factories and cleaned houses on the weekends to make ends meet. Throughout school, Rivas took computer electives and sharpened her programming skills. In her Senior year in high school she applied to MIT, one of the top science universities in the world, "just to see if she could get in." She did. Rivas had never left Los Angeles and was afraid to leave home; she was not even sure if she wanted to go. When she decided she did want to visit the campus she could not afford the plane fare, but a relative lent her the money. Visiting the campus made all the difference. She loved it immediately, and decided to attend. As a Latina who had never left Los Angeles, Rivas grappled with 'culture shock' at MIT. "It felt like it was another country," she recalled. "I had never met so many students who had parents who were college-educated. It was shocking to see kids whose parents were guiding them. I didn't have that." After college, Rivas moved to Chicago where she worked for Motorola for several years, and became involved in nonprofits. It was through her own experiences as well as through volunteering at youth-serving organizations that Rivas decided to focus on STEM education for low-income students of color. In 2011, after attending grad school at Harvard and working in science and engineering education for 10 years, Rivas decided to go back to Pacoima to start DIY Girls. Rivas decided to dedicate herself entirely to her organization in October of 2013 to keep up with the demands and grow it further. It has become a day and night job. Most of the funding comes from foundations and corporations, and initially, from a successful Indiegogo campaign. The organization is always in need of volunteers, advisors and, in kind donations of any type of equipment, she said. Rivas has expanded the program; apart from the one at Telfair Elementary, DIY Girls recently launched at Vaughn Next Century Learning Center in San Fernando. At Vaughn, 98 percent of students qualify for free or reduced lunch. Rivas loves to see parents relate to the work their daughters are doing in the workshops. Many of them work in construction and factories. "People in our community are not engineers, but they know how to make things." 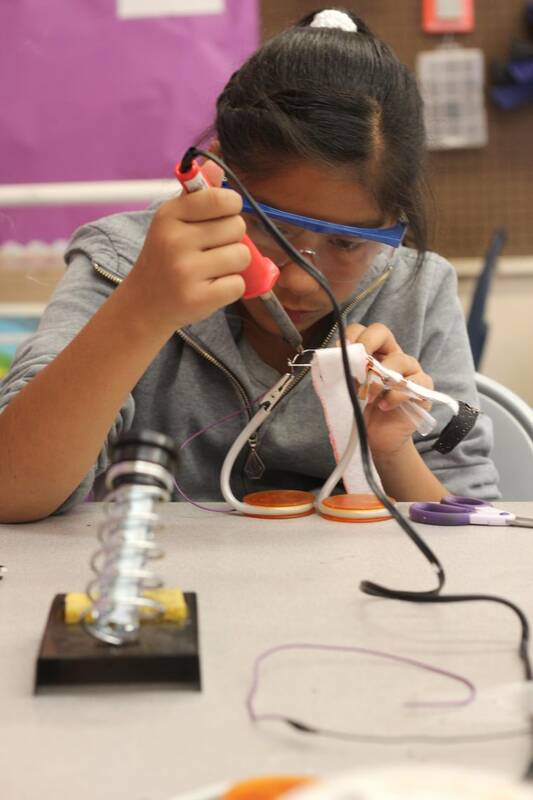 During the workshops, the girls learn skills from soldering electronics to using 3D printers. DIY Girls also offers monthly workshops for women interested in hands-on technical skills. Rivas love to see parents relate to the work their daughters are doing in the workshops. Many of them work in construction and factories, and many girls want to do things their dads know how to do. "People in our community are not engineers, but they know how to make things. They know how to make everything," she said. Understanding science concepts and knowing technology is only one part of the equation. As Rivas knows, it is just as important that Latinas see themselves in higher education and science careers, and are not afraid of pursuing it, something she hopes DIY Girls helps instill. "We're focusing on making sure they know how to advocate for themselves and develop confidence," said Rivas.